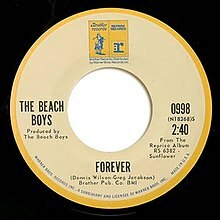 "Forever" is a song written by Dennis Wilson and his close friend Gregg Jakobson. It was released in 1970 as the ninth track on the Beach Boys' Sunflower album. The song, along with the rest of the album, was produced by the Beach Boys. (1971) "Wouldn't It Be Nice (live)"
The lead vocal is sung by Dennis. His brother Brian declared, "'Forever' has to be the most harmonically beautiful thing I've ever heard. It's a rock and roll prayer." The violins were actually played on a Chamberlin. A newly recorded version of the song, featuring lead vocals from actor and Beach Boys sideman John Stamos, appeared on the band's 27th album Summer in Paradise in 1992. Stamos performed the song on at least three episodes of his sitcom Full House. On the first episode of Fuller House in 2016, "Forever" was once again performed by Jesse and the Rippers with other characters from the show singing as well. An a cappella version of the song was included on the Beach Boys' Hawthorne, CA anthology album. ^ White, Timothy (2000). Sunflower/Surf's Up (CD Liner). The Beach Boys. Capitol Records. ^ Jones, Doug (30 August 2016). "Low Tide: The Beach Boys hit rock bottom in 1992 with 'Summer in Paradise'". Dangerous Minds. Retrieved 10 September 2016. ^ "John Stamos, Beach Boys Perform Together In Hawaii, 'Full House' Memories Flood In". Huffington Post. Huffington Post. Retrieved 2 February 2017.